I was entirely caught by surprise when I first saw this watch, described by Prince Gera as a "racing car dashboard watch". And that description fits. 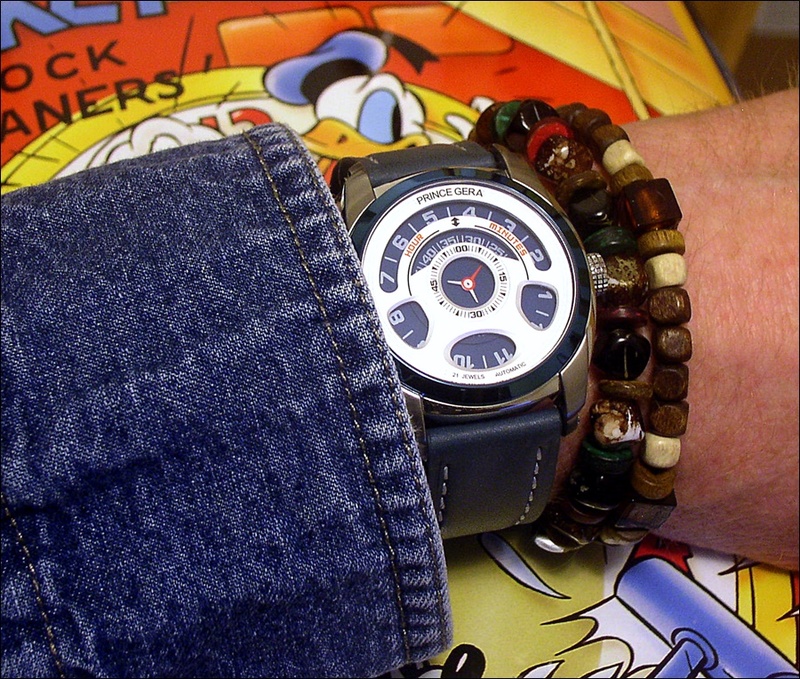 The watch is unique at a glance, clearly automotive in influence, fun on the wrist and very comfortable to wear. It's not the easiest watch to read until one gets used to the quirky time-reading setup, but once the logic sinks in, the extra glance that might take is well worth it. I suppose it also might be said that the "dashboard" harkens back to the '70s jump hour/pseudo-digital efforts but, if so, this watch is new twist on that theme, and it doesn't look at all dated or clunky to me. I love the dial, even though it isn't purely practical. The lower three windows don't mean much of anything other than that's where some not-presently usable numerals reside, but they do balance the dial, adding visual interest if not utility. The upper two curves are where the truth of time lies, hour outer, minutes inner, as the discs below rotate clockwise. The time on the accompanying wrist shot is 4:33. The time is set by rotating the crown until the correct hour is upper center visible, and *then* till the correct minute is lower. It's almost like the correct time just slides into place. Like I said: fun. 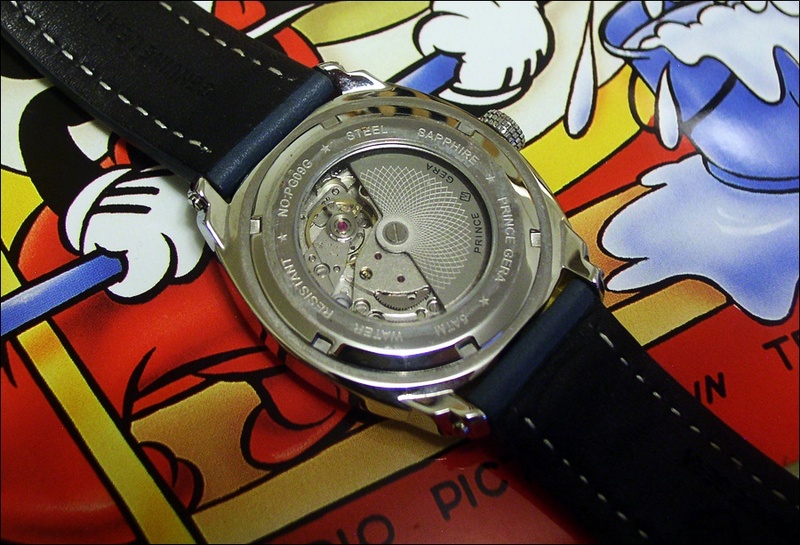 The central rotating bi-colour tristar second hand fits perfectly in the design, is very easy to decipher. It's eye-catching without being distracting. The 42mm stainless steel case (w/c) rests very easily on my wrist, with a weight that is present but not at all over-bearing. The lugs are lightly brushed and the rest of the case is polished, which sets the lugs off well against the rest of the watch...and makes photography much easier. Smart. When it comes to straps, I generally stick to browns and blacks but whoever chose the texture and colour for this model gets about a million points from me. 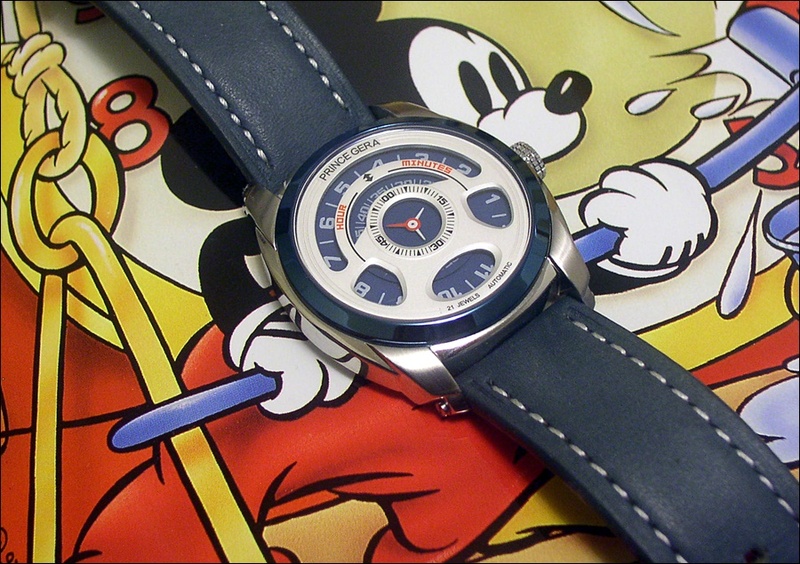 The 22mm width, genuine leather stitched strap is thick but nicely workable, and the matte (I'd say Gulf Blue) finish contrasts very naturally as the satin reflective blue bezel shades between Boston Blue and Summer Sky, depending on the light. And...have you seen this promo for what I think is an equally entertaining stable-mate? My conclusion? if you're looking for a sporty watch with unique eye appeal, then Prince gera's "racing car dashboard watch" might be exactly the ticket. It's eye-catching, very comfortable to wear, a tasteful step away from the traditional three-hander, and a bold statement from a newer designer. I just love having this watch on my wrist.